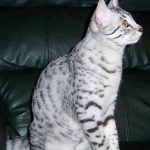 Currently we breed F1 Savannah cats, both Standard and Non-standard, F-2 Savannah cats, F-6A, B and SBT Savannah cats, Double Registered Egyptian Maus, Geoffroy’s Cats and Safari Cats. We acquired our first Serval, Jeffree, in 2004 and that’s when we added the “exotics” portion of our name. 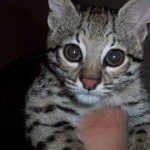 The summer of 2005, our presence was graced with the birth of our first F1 Savannah kittens. It been a whirlwind ever since. 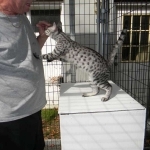 We retained one of our first F-1 females Pearl and brought in Merit an Egyptian Mau as her mate in the summer of 2007. We added Truffles an F-5 SBT as her new mate several years ago and retired to Merit to sire double registered Maus only. We have added several other queens of various generations as well as F-5 fertile males to offer Savannah to Savannah breedings as well. Our F-6 kittens have all the beauty of their spotted ancestors but all the social skills of a truly great pet. As a compliment to our spotted hybrid cats we are now breeding and offering double registered Egyptian Maus kittens for those who want that wild spotted look but a 10,000 year old gentle fully domestic disposition. A rare breed, we have imported a new stud Van from Canada to help Merit out in this program. 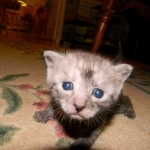 These cats are perfect companions to both adults and children as well as other pets and are legal anywhere! 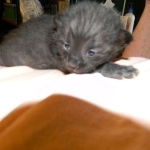 We pride our selves on breeding Healthy, Well Socialized and Beautiful kittens in that order. We are happy to allow Cattery visits by appointment and would not buy a cat from a breeder that would not allow one.